Nalbinding is an ancient yarn technique. Nowadays people often connect it to Vikings and Scandinavia, and here in Finland it is sometimes thought to be a speciality from East Finland, although in reality nalbinding has been used almost allover the world. nalbinding (English), naalbinding (Eng), nalebinding (Eng), single needle knitting (Eng), needle binding (Eng), nail binding (Eng), looped needle-netting (Eng), knotless netting (Eng), nålbindning (Swedish), söma vantar (Swe), nåla vantar (Swe), nålebinding (Danish, Norwegian), naaldbinden (Dutch), Nadelbinden (German), Nadelbindung (Ger), Schlingentechnik (Ger; using thumb loops), Freihandmethode (Ger; working without thumb loops), вязание иглой (Russian), Наальбиндинг (Rus), nõeltehnika (Estonian), tkanie igłą (Polish), vattarsaumur (Icelandic). The oldest nalbinding fragment, supposedly a piece of a mesh sieve made of plant fibers, is from a cave in Israel, Nahal Hemar, approximately 6500 BCE. Fragments found in Denmark date from 4200 BCE. In West China, Tarim basin area (Zaghunluq), several well preserved mummies with beautiful clothes have been found, from 1000 BCE. The finds include two hats, supposedly made by nalbinding technique. A beret (photo). From Egypt, 400-600 CE, there are socks, at least one pair of which was made in the so called Coptic Stitch (also known as Tarim Stitch) (link; red socks), and at least one pair in Mammen Stitch (link). The so called Coptic Stitch (Tarim Stitch) has been known also in Peru (South America), about 100 CE (link). The Coptic Stitch looks like knitted structure, but knitting wasn't known until about 1000 CE. Paracas textiles (link). From 970's CE there is a sock from York (England) (link; type 'sock' in the search box). The stitch type used in this sock has not been found anywhere else, so it is called York Stitch or Coppergate Stitch (also Jorvik Stitch), based on the place where it was found. In Mammen (Denmark), dated from winter 970-971 CE, there is a grave of a man buried with expensive clothes that include nalbinding in gold and silver threads (link; note the Danish text says 'nålebinding', but the English version 'crocheting'). Only a few old textiles or their pieces have preserved to our days, but since the 1000's CE there are more fragments and even whole mittens and socks (North Europe; Russia). These days, nalbinding is still practised at least in Venezuela (South America) among the Pemon Indian tribe (video; see at ab. 4:00-4:40 min, a woman making a string basket with a metal needle. The bottom part of the basked is perhaps button hole stitch (I cannot see clearly), and the upper part seems to be Coptic Stitch. In Iran (Middle East), people have made giveh shoes (link; see row 3) still about 40-50 years ago, so probably there still are people alive who master nalbinding. Burning the dead used to be the habit in Finland, and that is one reason old textiles have not been preserved. Not until at the end of the Viking Era, approximately 1000 CE and thereafter, the dead have been buried into the ground. Bronze jewels and bronze items buried with the dead have helped pieces of textiles to preserve in the graves although the Finnish soil otherwise doesn't keep textiles very well . Many of the fragments found are small, only the size of a thumb tip or a match box, and no whole mittens have been found. The oldest nalbound fragments found in Finland are approximately from 1000 CE. Striped fragments of a mitten from Eura early 1000 CE (southwest Finland), fragments from Masku and Köyliö 1050 CE (southwest Finland), and a striped fragment of a mitten in Kekomäki in Kaukola (Ceded Carelia; the area nowadays belongs to Russia), and fragments of two separate mittens from Tuukkala (East Finland), all from 1200 CE. 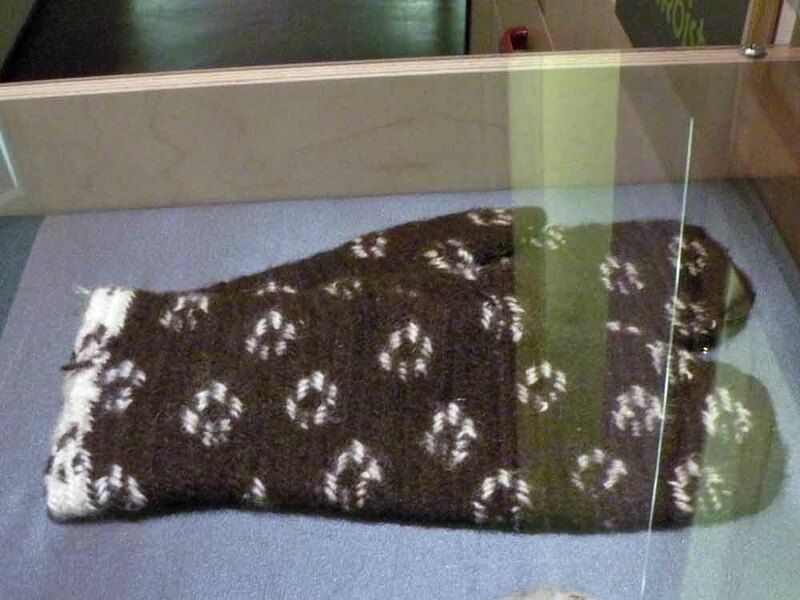 In the Finnish museums the oldest nalbound mittens, others than the archaeological fragments, are from the late 19th century. Knitting with five needles spread into Finland, first through the western parts of the country in the 17th century, and crocheting became known probably not until in the early 19th century. Despite the growing popularity of knitting and crocheting, the art of nalbinding was rather common in the eastern and northern areas of Finland until 1950's, and is still today known and alive in some areas, mainly in the east, in Lappeenranta and Joensuu areas, for example. Women, but also men, nalbound not only work mittens, which often were simple and gray, also white mittens for festivals (link; link2 from former Jääski (East Finland, next to Joutseno); link3), and decorated them with red and green stitches, and tassels (in East Finland) or fringes (in West Finland). Decorated mittens were used in church and festivals, and nalbound mittens, among several other handmade textiles, were also made as presents for fiancés (grooms), and given out as presents at the engagement parties and weddigns, for new in-laws and other important guests. Brides also had to give out small handmade presents like socks, hankerchiefs or tablet/inkle woven belts to practically everyone who had been helping at the wedding, including musicians, dish washers, waiters, etc. Finnish nalbound church mittens, South Carelian style. in Ms Toini-Inkeri Kaukonen's article. 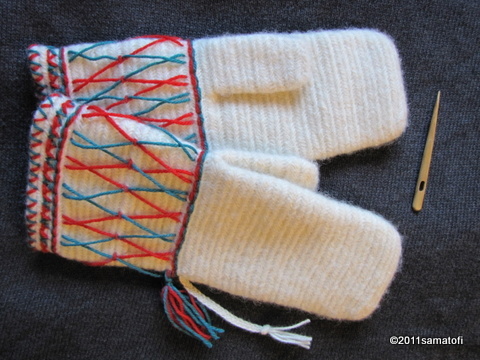 In Finland the nalbound mittens have traditionally been started at the top, and the top has been more or less square shaped. Some nalbinders have rounded the corners a bit while others have now. Square shaped tops have been known elsewhere in the Nordic area, too, though mostly they have been rounded at the top in Sweden and Norway. The cuff may have been straight, widening a bit to the cuff, or more strongly bell shaped. Regarding felting or fulling nalbound mittens, Ms Toini-Inkeri Kaukonen says in her article (1960) that almost all the persons who answered the Nalbinding Survey made by the National Board of Antiquities in 1957, told the nalbound mittens were usually not felted or fulled. They would felt little by little in daily use anyway. Only in some areas felting or fulling was common. Some old instructions tell to keep the mittens, inside out, above a pan of boiling water, and brush the mittens wiht a coarse brush, while other old instructions say to rub the mittens in a hot soapy water. One of the older nalbinders from East Finland I interviewed in autumn 2010, told that she had learnt to nalbind in 1930's, and when she was young, in her farmer family they used to nalbind piles of mittens for the autumn market every year. In Finland the 'border line' of knowing nalbinding followed approximately the line Sipoo - Tampere - Kokkola in early 1900's. In the east and north side of the 'border' the old skill was commonly known, and in the west side the Åland Islands made an exception. In the Åland Islands nalbound mittens were popular until 1920's, mainly in forest work and mail transporting. Men used to row heavy 'mail boats' from the Åland Island to the continent and back . According to the survey made by the National Board of Antiquities in 1957, the 'border line' of knowing nalbinding escaped in 50 years even more towards the east, and followed line Kotka - west of Kuopio - east of Kokkola. The most active area (in 1950's) was to the east of Kouvola - Joensuu - Kajaani axis. Reasons why the skill of nalbinding almost vahished in Finland after the 1950's probably include the growing textile industry, and the development of better and better materials, as regarding to weatherproofness, change of values, and the folk school reform. Still in the 1950's nalbound mittens were made mainly for men's outdoor work. They were used by men who worked in the farms, in the forest work, and who used horses as means of transportating heavy loads, for example logs from woods. In the North Finland, Lapland, also men working with reindeers used nalbound mittens. Except that the number of that kind of jobs has diminished, the availability of ready-made handwear has increased. It is easy to buy windproof and waterproof mittens or gloves at the shope, and thanks to waterproof footwear, additional mid socks or hair socks are no longer needed to keep the warmth in and moisture out. Change of values may play a role, too. Perhaps a factory made item has had a higher status compared to a home made one. The folk school reform at the beginning of the 20th century in Finland brought handicraft to schools as an obligatory subject, but among different types of handicrafts, teaching nalbinding technique was not included at all. 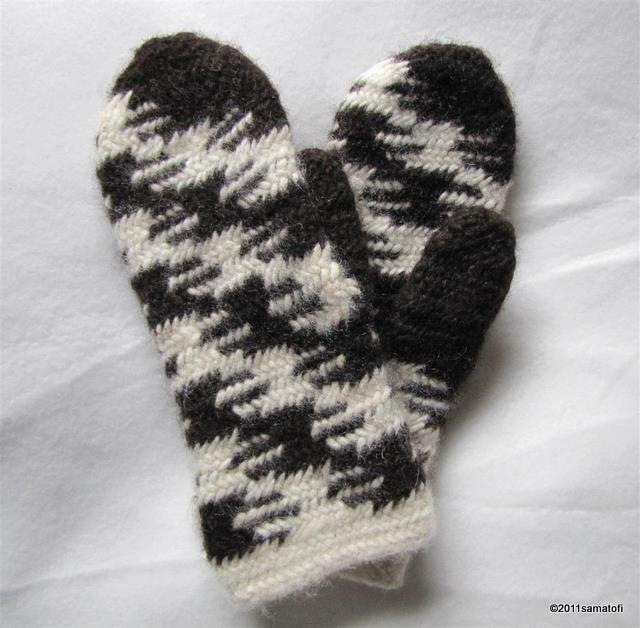 Ms Toini-Inkeri Kaukonen wrote in her article (1960) that making nalbound mittens has become fashionable among the handicraft hobbyists during the past years. Never did the skill of nalbinding in Finland vanish totally, however. There have been instructions in magazines, and there have been courses. Past years the raising interest in re-enacting, however, has made nalbinding more popular and more widely known art. Toini-Inkeri Kaukonen, "Kinnasompelun levinneisyys ja työtavat Suomessa", Suomen Museo 1960, p. 44-71.